Record piece rate data for employees whether by individual unit or compilation of days work! Enter each harvested unit as it is completed capturing who, what, where, when, rate of pay and cost in one entry. Using the scan feature to track the unit from field to final destination. 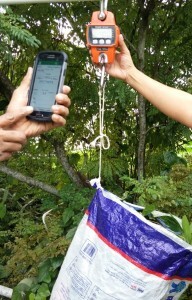 Use “Bluetooth” scale to record quantity. Make one entry at end of day or total for the particular location capturing who, what, where, when, rate of pay and cost in one entry. Bulk containers or trailers holding harvested product can be tracked form the field to packing or processing facility. Record data for each location where the employee works. 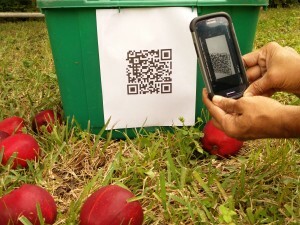 QR Codes – use for employee identification, pay rate, location, harvest item, equipment, materials, etc. Tracking – harvested product in bulk containers can be traced through the system using the scanning feature. GPS – coordinates for all entries are recorded, use for mapping purposes for analysis. “Use GPS” feature in system will load the location information with touch of one button. Camera – take photos of employees during check in and check out.